Are you inspired by the recent rise of on-demand services, and keen to be part of the next on-demand industry vertical? 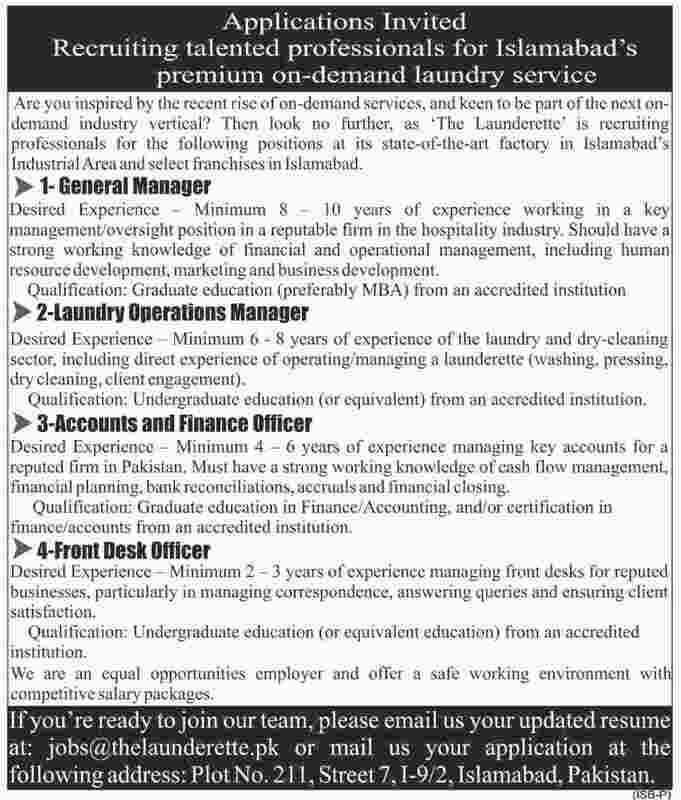 Then look no further, as 'The Launderette' is recruiting professionals for the following positions at its state-of-the-art factory in Islamabad's Industrial Area and select franchises in Islamabad. Desired Experience — Minimum 8 — 10 years of experience working in a key management/oversight position in a reputable firm in the hospitality industry. Should have a strong working knowledge of financial and operational management, including human resource development, marketing and business development. Qualification: Graduate education (preferably MBA) from an accredited institution. Desired Experience — Minimum 6 - 8 years of experience of the laundry and dry-cleaning sector, including direct experience of operating/managing a launderette (washing, pressing, dry cleaning, client engagement). Qualification: Undergraduate education (or equivalent) from an accredited institution. Desired Experience — NI minimum 4 — 6 years of experience managing key accounts for a reputed firm in Pakistan. Must have a strong working knowledge of cash flow management, financial planning, bank reconciliations, accruals and financial closing. Qualification: Graduate education in Finance/Accounting, and/or certification in finance/accounts from an accredited institution. Desired Experience - Minimum 2 — 3 years of experience managing front desks for reputed businesses, particularly in managing correspondence, answering queries and ensuring client satisfaction. Qualification: Undergraduate education (or equivalent education) from an accredited institution. We are an equal opportunities employer and offer a sale working environment with competitive salary packages. If you're ready to join our team, please email us your updated resume at. jobs@thelaunderette.pk or mail us your application at the following address: Plot No. 21 1 Street 7, I-9/2, Islamabad, Pakistan.